This magical yet horrific novel takes us on a journey through three generations of families, as they are torn apart and meet new people whom they may or may not bond with. Through heartache and pain, joy and birth, we see the strength of women during this time of war in Kabul. 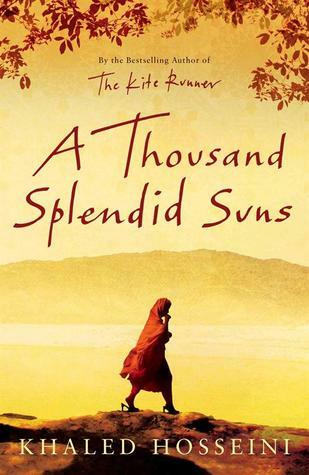 After reading The Kite Runner (check out my review here) I couldn't wait to get my hands on another one of these culturally fascinating books written by Hosseini. As mentioned in my review for the Kite Runner, once again I found it so interesting that he chose to write on a topic he knows about because this makes everything so much more real. The author grew up in the places that he writes these stories so he knows what they're like, for the good and bad, which is exactly what he includes in his writing. This novel really opened my eyes to how different people are treated in different cultures and religions around the world, which isn't something I've explored as much as I'd like to in novels. Another unique twist was that this novel follows the lives of two people that come together unexpectedly. At the beginning it's in the perspective of Mariam, who is only a child, but as the novel goes on we watch her grow up into a strong and intelligent woman, despite her hardships in the beginning. In the second part the perspective changes to Laila and we see her life as a child to woman. This was so interesting to read about because we got to see hoe their two lives, although completely separate and different, came together with more in common than first perceived. The final section has a split narrative of both Mariam and Laila which was really unique and something I enjoy in novels just to see the differing opinions between characters. Despite the brutal honesty in the plot and the pain the two protagonists and their families face, this was a profoundly written novel with a surprising happy ending (of some sorts). My favourite technique was moving through almost 3 generations with these characters and watching them grow and develop into their own identities. I would definitely recommend this to readers of historical fiction or those who want to be enlightened about another culture. This really reminded me how lucky I am and reminded me not to take things for granted - a very important message in life that most people forget (including me!) Hosseini only seems to have 3 novels, and since these first 2 have been astounding, I will definitely be getting my hands on the last one!